Brazil: Impact of Elections on Financial Markets, an Opportunity for Importers and Exporters? Recent events in Brazil generated volatilities in different financial markets, with a drastic shift in commodities, currency, bonds and stocks prices. This trend has already had a consequent implication for domestic but also foreign companies doing business in Brazil. For example, Spanish exporters will benefit of a 17% depreciation of the EUR versus BRL (from 4.92 the September 14th to 4.08 the October 29th). This opportunity may represent an interesting opportunity for European companies involved in Brazil to hedge a potential comes back on the 4.50 area. 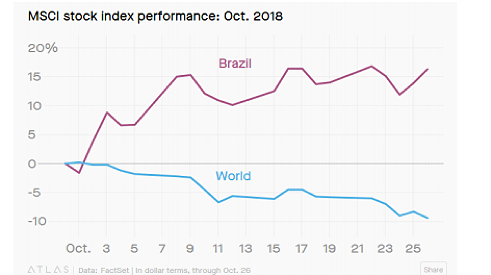 After a bloody month of October for Global Equity markets and indexes from all over the world taking big losses (Nasdaq & Nikkei: -9 %; China: -7,75 %; CAC 40 & DAX: -7 %; India: -5,75%), the only survivor appears to be Brazil. Indeed, the BOVESPA grew by 10% this last month of national election that ended with the victory of Jair Bolsonaro, far-right party candidate promising a market-friendly economic program. Alongside with its counselor and future economy minister, Paulo Guedes, a University of Chicago economist and fund manager known for its market-friendly position, Bolsonaro promised to undertake reforms widely praised by national investors. Firstly, the new cabinet plans on privatizing every state-owned firm, including both energy giants Eletrobas and Petrobas, to raise over $400 billion and reduce the budget gap. This symbolizes the business-friendly policy promised during the election including deregulation and tax exemptions for companies. This strengthened analyst view of the Brazilian stock market, the national Index is up 13% since September and trading way beyond historical levels, leading analysts say it could reach 100,000 by the end of the year (current level is around 88,000 while it was at 75,000 in September). In order to bring deficit from $37bn to “zero” as promised, the elected president planned spending cuts by implementing, what will appear to be the main challenge of its mandate, a pension system reform. This ambition to reform the country led investors to endorse Bolsonaro’s candidacy over the left-wing candidate. Moreover, the Workers Party is considered by many Brazilians to be responsible for the country’s worst recession in history. Indeed, the GDP of the eighth-largest economy in the world shrank by almost 8% and close to 13 million people are unemployed. 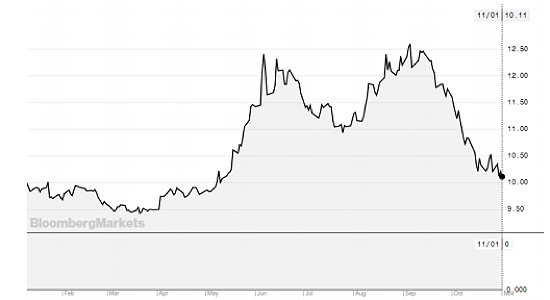 The announcement of reforms and project to reduce deficit already had an impact on financial markets, firstly in the national bond market with the yield on the 10Y Government Bond going back to last month of May levels at 10% (against 12,5% in September – See Below). Those announcements combined with the assurance that the Central Bank will be able to act independently brought back the domestic currency to the milestone of 3,6 per dollar with analysts planning a stabilization at those levels. Following the strengthening of the Real, Price of nationally produced commodities such as Sugar and Coffee (Brazil being responsible for a Third of worldwide production) rallied last month. Indeed, a stronger Brazilian real makes commodity exports less attractive for holders of other currencies (See Graph below). Even though investors have welcomed Bolsonaro’s election positively, no details of this program have been released and there is no certainty on whether it will be approved or not. Indeed, his Social Liberal Party (PSL) doesn’t hold the majority at the house of Congress, which could make it more complicated to vote constitutional amendments such as a pension reform. On the financial markets side, analysts believe the Bovespa index could resume its rise during the next months if the new government (official on the 1st of January) materialize its reforms in 2019. Otherwise, this positive trend won´t be sustainable. Volatility doesn’t necessarily mean bad news, with some anticipation and expertise on its side, it could also represent a strong opportunity for any kind of business. 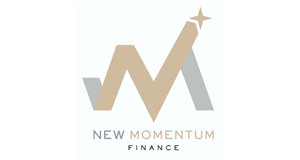 New Momentum can assist you in all kind of capital market problematics. La entrada Brazil: Impact of Elections on Financial Markets, an Opportunity for Importers and Exporters? se publicó primero en Asociación Española de Financieros de Empresa – ASSET. https://www.myluxepoint.com/wp-content/uploads/2018/11/brazil01-1.png 454 675 Carlos https://www.myluxepoint.com/wp-content/uploads/2019/01/logo2v-300x88.png Carlos2018-11-21 11:07:152018-11-28 10:18:03Brazil: Impact of Elections on Financial Markets, an Opportunity for Importers and Exporters?